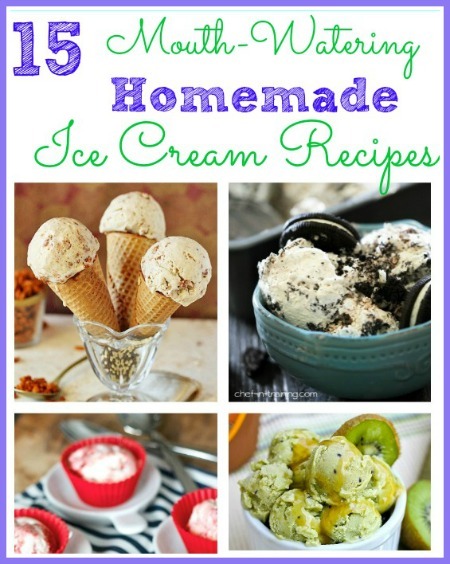 Do you love the the rich and creamy flavor of homemade ice cream but lack an ice cream churn? No problem! 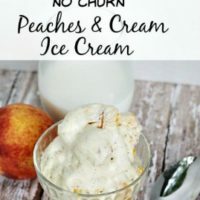 You can make your own homemade no churn ice cream at home easy as can be with just a few ingredients, and you can use your stand or hand mixer to create it. So easy to customize to your favorite flavors with things like; fruit, nuts, extracts, and spices. 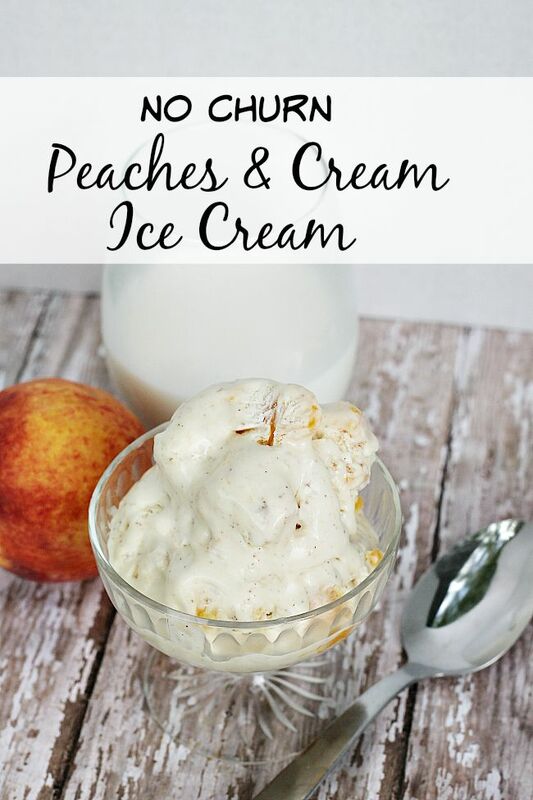 Peaches are in season right now so this is the perfect time to try my recipe for Peaches and Cream No Churn Ice Cream! 1. If you have room in your freezer pop your metal mixing bowl inside for about 15 minutes. If not, that’s ok, it will still come out great. 2. Pour heavy cream into bowl and whisk on medium until a soft peak forms-this means that when you pull beater out they will hold shape for at least 5 seconds. 3. Stir in extract, brown sugar, and condensed milk- beat on medium high until combined, just before stiff peaks form. 4. Fold in peaches and cinnamon by hand until just combined. 5. Pour Mixture into an 8×8 pan- I recommend glass. 6. Cover well with plastic wrap and place in freezer for 5-6 hours until solid. If you have room in your freezer pop your metal mixing bowl inside for about 15 minutes. If not, that’s ok, it will still come out great. Pour heavy cream into bowl and whisk on medium until a soft peak forms-this means that when you pull beater out they will hold shape for at least 5 seconds. Stir in extract, brown sugar, and condensed milk- beat on medium high until combined, just before stiff peaks form. Fold in peaches and cinnamon by hand until just combined. Pour Mixture into an 8×8 pan- I recommend glass. Cover well with plastic wrap and place in freezer for 5-6 hours until solid. OH! That looks delicious! Thanks for sharing, Manuela! Pinning! Glad you like it! Thanks for pinning! Oh my! 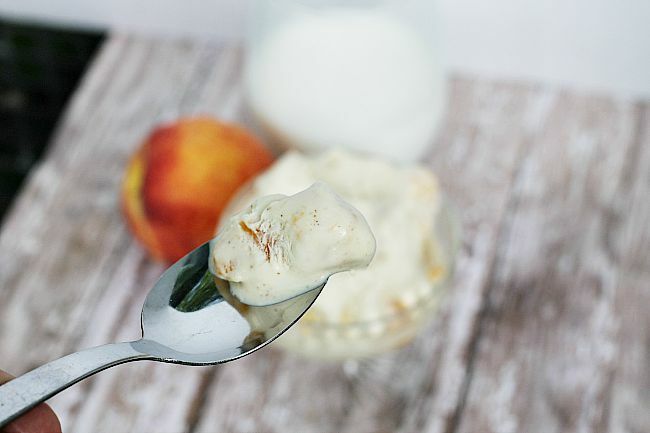 Homemade peach ice cream sounds wonderful! My son’s girlfriend is coming for dinner tomorrow and she loves peaches. This will be perfect. Thanks for sharing. Even though my thighs HATE ice cream, I beg to differ. I haven’t had real ice cream in a long long time! My husband makes a really good sort of sorbet thing in the Vitamix with fresh fruit and soymilk or yogurt. This looks amazing! We don’t have a churn so it is perfect for us! I am pinning!!! 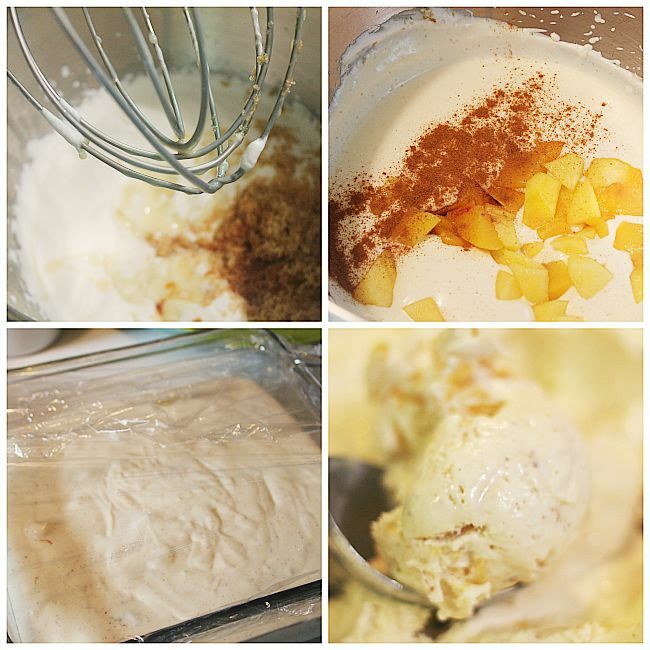 Thanks for sharing your post at #HomeMattersParty I hope to see another mouth-watering recipe or post next week. LOL! Thanks again. I love peach ice cream! This sounds perfect for these hot August days! Thanks for linking up to The Handmade Hangout! You’ll be featured on my blog today when the new linky goes live at 6pm ET. I hope you’ll stop by and link up again!